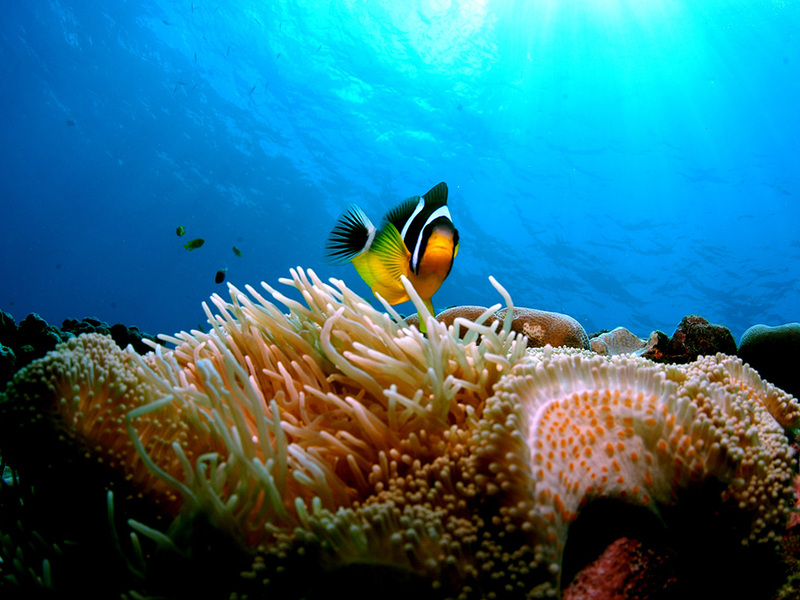 North Island has over 20 dive sites within close proximity, each site fascinating in itself, offering a diverse range of topographies and unique marine sightings. Here are our top 5 not-to-be-missed sites for PADI Open Water Divers (qualified for depths up to 18m). 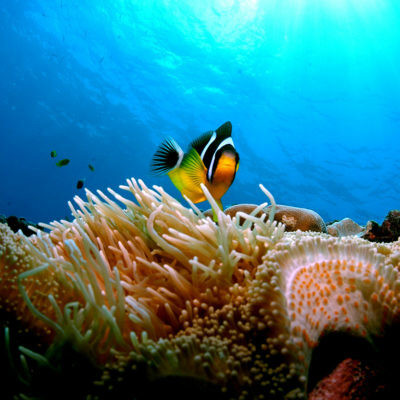 The big attraction of this site is the abundance and variety of fish life that teem around three coral mounds. Seasonal shoals of sprats inhabit the reef from late June, making it virtually impossible to see the reef, hence the name Sprat City. 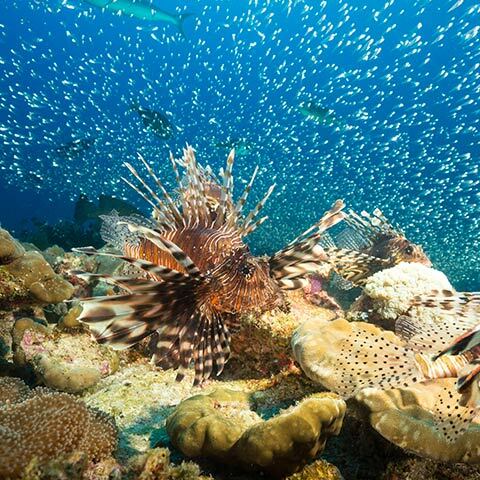 Other common sightings are Great Barracuda, Golden Pompano, Fulvie Kingfish, Golden Kingfish, Regal Angelfish, Humphead Parrotfish, Napoleon Wrasse, Powder-blue Surgeonfish, Blue-banded Surgeonfish, Unicornfish, White-tip Reef Sharks, Variegated Lizardfish, Emperor Angelfish and Oriental Sweetlips. Shoals of gamefish move in and out, depending on the season and time of the day. Spotted Eagle Rays are also a regular sighting. Rated very highly by the dive team, this site allows divers to swim alongside granite cliffs that provide breath-taking underwater scenery. Experienced divers can swim into the deep cracks and the sound of the waves breaking overhead is something to experience. Shark activity and gamefish sightings can be expected. 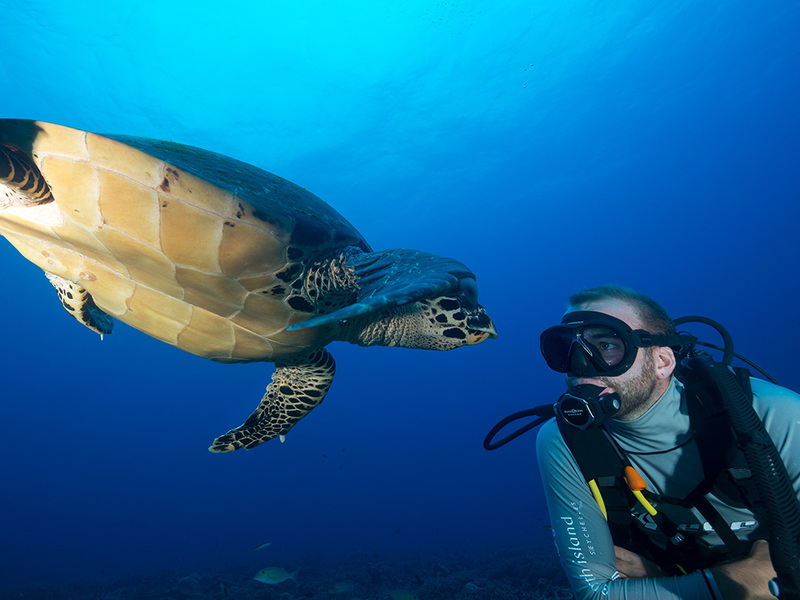 This is a shore-entry dive during the North-West monsoon with shallow depths that make it an ideal site for Discover Scuba Divers to gain their confidence in the water for the first time. Appropriately named the Aquarium, this site is full of marine life. 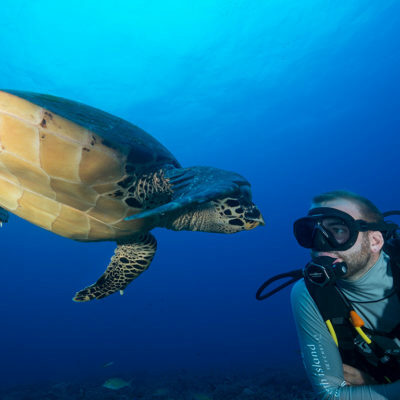 You’ll have the chance to see Spotted Eagle Rays, juvenile Hawksbill Turtles and you may even get the unique opportunity to swim with the gentile Gray Reef Shark resident to this site. 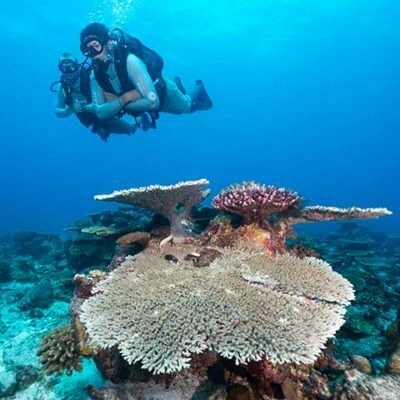 In addition to stunning topography and abundant coral life, the other enticing feature is the two anchors situated on this site – it is always an exciting challenge to find both. From the dive team’s perspective, a unique encounter here is the Orbicular Batfish. Towards one end of the reef they appear as ghosts and circle the divers for a long period of time. If divers are quiet and steady enough, the fish will approach and nibble on their fingers! 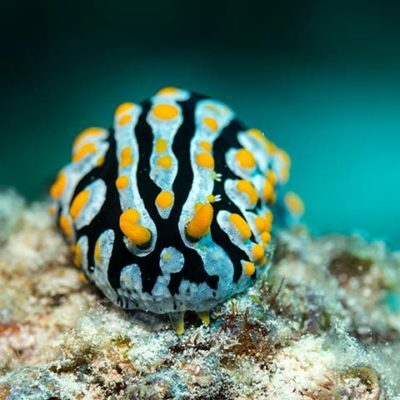 Nudibranchs are often seen, along with the Spanish Dancer’s Eggs. The odd White-tip Reef Shark can be seen as well as Green Job Fish and Paper Fish. This site is very good for drift diving as it’s approximately 900m long from South to North of the Island. 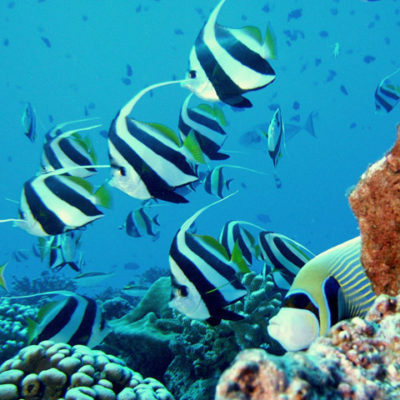 It’s fun to swim around looking for small aquatic animals while large gamefish swim above your head, accompanied by Orbicular Batfish throughout the dive. Turtles, Sharks, Lobster and Rays are often spotted on the dive, along with pods of Bottlenose Dolphins when feeding on schools of Mackerel. 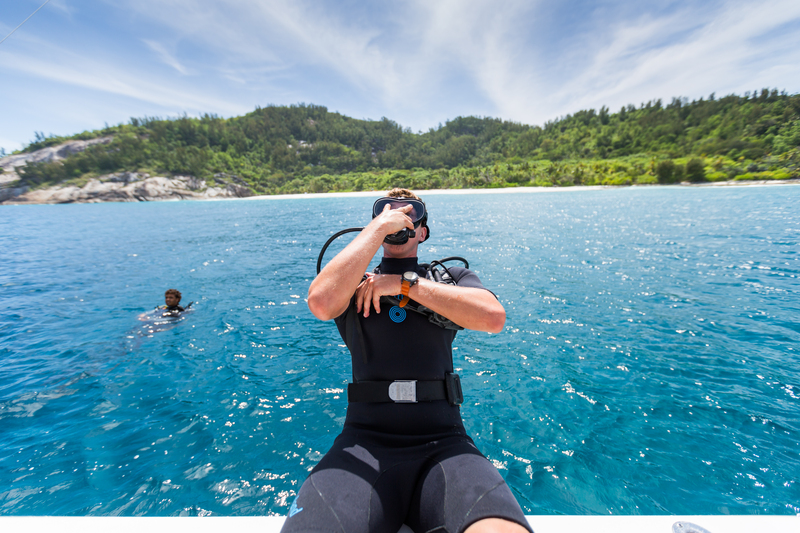 Click here to learn more about diving on North Island.